ATW: What does 🙌 - Raising Hands Emoji mean? The raising hands emoji depicts two raised hands, palms up, with lines above them, implying motion. It's used in a celebratory way, to express joy, pride, or surprise (the good kind). 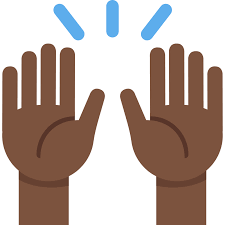 Rooted in the idea of “give me ten!” (slapping your two palms against someone else’s), the raising hands emoji was originally approved as part of Unicode 6.0 in 2010 under the name “Person Raising Both Hands in Celebration.” This wooot-filled emoji was added to Emoji 1.0 in 2015. The raised hands emoji then is used in posts and texts that relate to a victorious personal moment, a sports win, or a moment of pride. Del Boy or Phantom of the Pitch?